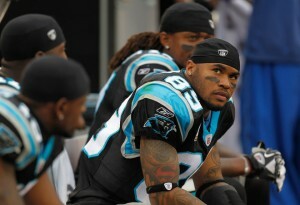 When will Panthers go to the ground game? Cam Newton had his first reality check this week, held to 212 yards and one interception. He admittedly was confused by the Tennessee scheme which had a spy on him for most the game and caused him to misread the defenses. His misreads left him scrambling for the open man, especially since the Titans were effective at eliminating Steve Smith who finished with only 33 yards. The lack of a run game didn’t help either, with DeAngelo Williams and Jonathan Stewart totaling 58 yards on the day. The Panthers Achilles heel was exposed finally and we can expect more defenses to follow suit with the Titans scheme.